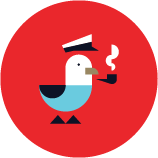 To start reaping the benefits of complete dock management, let’s get familiar with Dockmaster-Entered Reservations. You may have noticed on your marina’s Dockwa Dashboard the “New Reservation” button in the lower left-hand corner. Clicking this button starts a “dockmaster-entered” reservation. 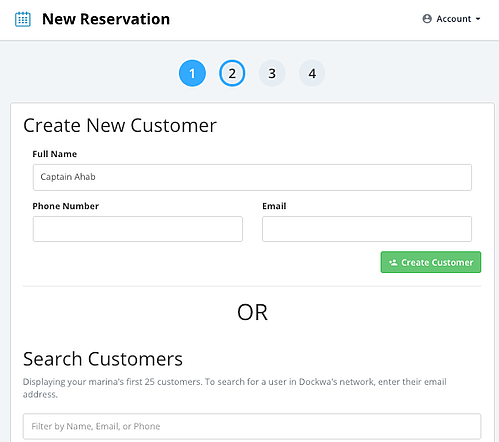 You can create dockmaster-entered reservations for any reservation made outside Dockwa's booking platform (ie. requested via phone or email). With each dockmaster-entered reservations you create, Dockwa creates a more complete a depiction of your marina. 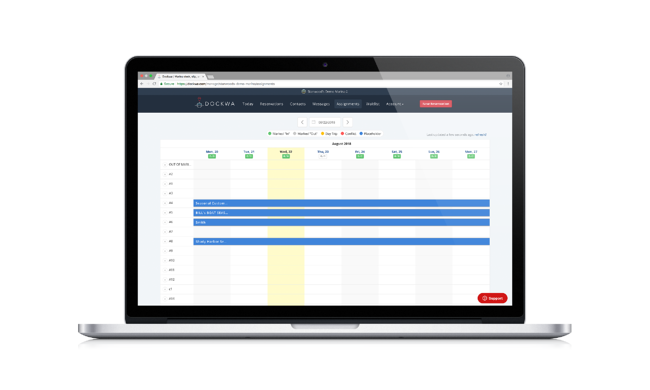 Short term and long term, online and offline dockage reservations live together, so you have all you need, in one centralized place, to understand the past, present and future of your marina. 2. Upon clicking, enter the boater’s arrival, departure, and vessel dimensions to receive a revenue estimate. If you are using Dockwa Assignments, you'll see the dockage available during the span of the reservation. 4. On the following screen, search for an existing boater contact in your Dockwa database, or create a new boater contact. 5. Next up: Boat info! 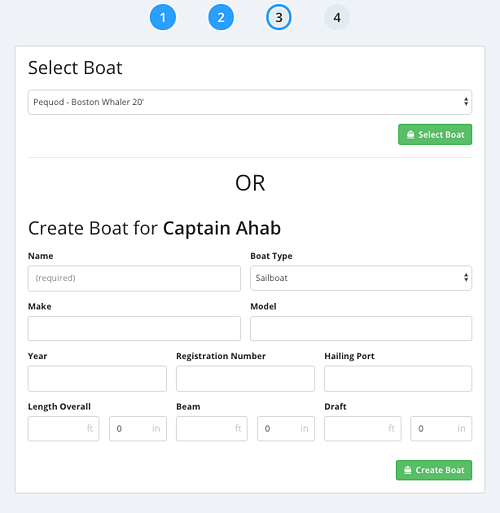 Select the boat of an existing customer or enter the details of your new boater’s vessel. 6. Your final screen lets you select your boater's payment method. When your boater is not paying upfront, but plans to pay later by credit card, select "Add card later." This will appear as an unpaid reservation in your Dockwa Dashboard. When your boater is paying for dockage by cash, check, or ACH, select "Collect direct payment." You can record dockage deposits and full payments once you confirm the reservation. Note for your accountant: Cash/Check/ACH payments will appear as a "Direct" payment in your Payments report. Credit card payments will appear as a "Credit" payment in your Payments report. 7. 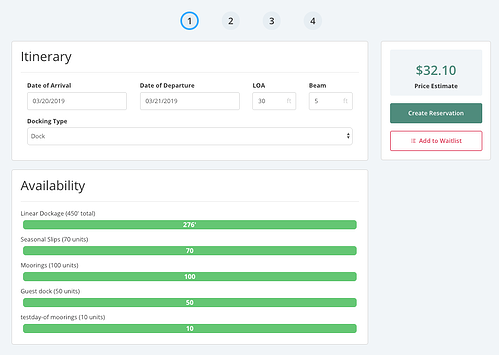 Once you've selected the boater's payment method, click “Create Reservation” to process the boater’s payment and add the reservation to your Dockwa dashboard. 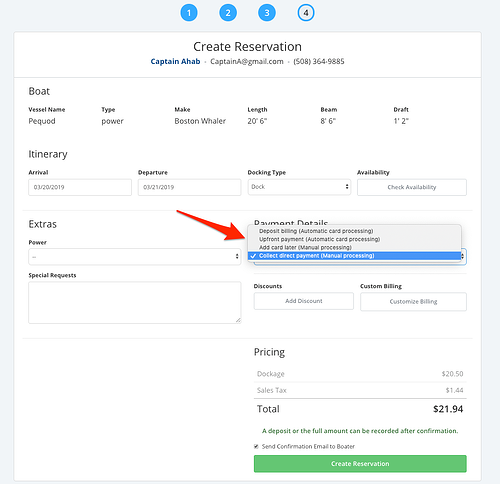 You’ll be able to cancel or modify this reservation just like your other Dockwa reservations. "With Dockwa, we don't have to worry about filling the marina, can interact with our boaters digitally, and have streamlined our billing and accounting processes. We're also able to spend more time outdoors on the docks, since we have everything we need to manage our slips on Dockwa's mobile app. Now that you’ve got the hang of dockmaster-entered reservations, it's time to set up your marina's Space Groups. Space Groups allow you to assign boaters to specific dockage to give you a complete picture of what dockage is filled, when!